The feral pigeon is the number one urban bird pest. They exist in large numbers in every city across the country. Feral pigeons are descended from rock doves and have adapted extremely well to life in an urban environment. Several traits have allowed them to dominate the urban landscape. Pigeons are not afraid of people; they roost and nest readily in manmade structures and they have a diverse diet. The standard pigeon has a short neck with a small head. Their short legs with the level front and hind toes allow them to perch on branches as well as walk on flat surfaces. 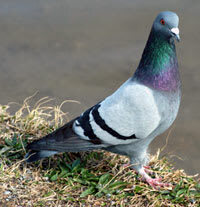 The feral pigeon is generally blue-grey with a white rump; has iridescent feathers on head and neck; two broad black bars across each wing and a broad dark band across the end of the tail. They also can display white, brown or grey plumage. Nest building is very simple and often consists of a few stiff twigs. The male will pick the site. They prefer small flat areas away from the ground. Look for nests along building ledges, bridge supports, air conditioning units, window sills and the like. In crowded flocks, pigeons will even forgo nest building and lay eggs directly on a protected ledge. A mating pair can typically have up to nine broods a year. The female will usually lay two eggs at a time. The eggs are a solid bright white colour. The eggs take roughly eighteen days to hatch and thirty-five more days before the fledglings leave the nest. Pigeons are not migratory. The natural instinct is to stay near their birth site. This trait gives the pigeon a very determined personality when it comes to roosting at a particular site, much to the dismay of the inexperienced pest control technician. The daily cycle of a pigeon is to roost at night, feed in the morning and loaf in the afternoon. Breeding can occur year round. The uric acid in their droppings is highly corrosive. Roosting flocks can cut a roof life in half. Extensive damage to air conditioning units and other roof top machinery is common place. There are also other economic costs associated with pigeon infestations such as slip and fall liability and the projection of a poor company image. In addition the bacteria, fungal agents and ectoparasites found in pigeon droppings represent a serious health risk.